I Love My Navajo Boots! As soon as I saw these Soul Cal Deluxe Fringe Borg Boots in Republic whilst in Newcastle I knew I had to have them. Sadly they didn’t have my size, not to worry I thought to myself, I can get them online. To my dismay they were sold out online, so I thought I would try my local Republic store. It turns out they don’t stock shoes! So at the weekend I had to drag my Fiance to the next nearest store so I could finally get my hands on a pair. Thankfully they had my size & I ran straight to the till with them! 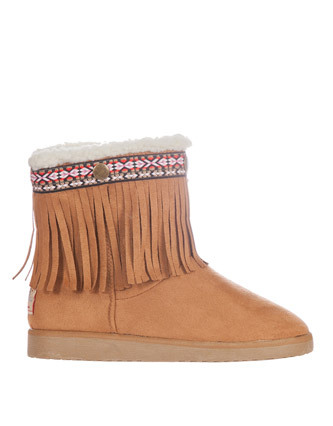 I love the subtle tribal pattern & the fringe detail, it gives such a native/navajo look to them! I can see me getting a lot of wear out of these this Season. They are lined with fur so they will be nice & cozy, plus I think they will be quite versatile.